Minister of Railways Shri Suresh Prabhakar Prabhu felicitated Indian Railways Women Cricketers of Indian Women’s National Cricket Team (Women in Blue) in Rail Bhavan on 27 July,2017. Minister of State for Railways, Shri Rajen Gohain was also present on this occasion. Chairman, Railway Board Shri A.K. Mital & Member Staff, Railway Board Shri Aditya Kumar Mittal other senior board members & Executive Director Sports & Secretary Railway Sports Promotion Board (RSPB) Ms Rekha Yadav & all the ten Railway Women Cricketers of Indian Women Cricket team were present on the occasion. Speaking on the occasion, Minister of Railways Shri Suresh Prabhakar Prabhu said that this is a historic moment that, for the first time, Indian Women Cricket Team gave such a marvelous performance and stood second in the World Cricket Championship for Women. He said that this a great example of women empowerment in India which shows that on giving reasonable opportunities women can do wonders even at the international level. He said that it is a proud moment for every citizen of the country. He said that out of total 15 players of Indian Women Cricket Team, 10 Women Cricketers are from Indian Railways which gives a feeling of deep pleasure to Indian Railways too. He further said that Indian Railways is proud of them and will ensure the future growth of these excellent women players. It is a moment of great pride for Indian Railways that of the squad of 15 players of Indian Women Cricket Team, 10 Women Cricketers were from Indian Railways. 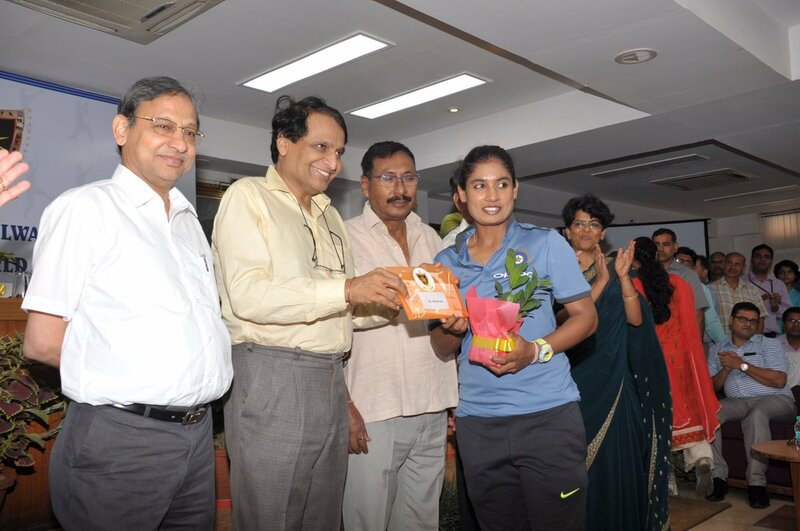 The team was captained by Railway Employee Ms. Mithali Raj. Other Railway Women Cricket players include Vice Captain Ms. Harmanpreet Kaur , Ekta Bisht, Poonam Raut, Veda Krishnamurthy, Poonam Yadav, Sushma Verma (wicketkeeper), Mona Mesharam, Rajeshwari Gaikwad and Nuzhat Parween. Ms. Harmanpreet Kaur was outstanding batsman during the championship and scored 171 runs in just 115 balls. Indian Railways Sports has been excelling in its mission of promoting Sports at National and international level and has become a precedent in sport’s arena for supporting Indian players apart from its primary Social obligation of rail transport on Pan-India level. Participation in the Indian Cricket Team is another feather in Railway’s cap after sending a squad of 34 sportspersons in Olympics and bagging an Olympic medal by Railway woman employee Ms. Sakshi Malik in wrestling. At this felicitation ceremony, Shri Suresh Prabhu, Minister of Railways has also announced promotion of Ms. Mithali Raj and Harmanpreet Kaur as Gazetted Officers in Indian Railways and out of turn promotions to all Railway Women Cricket players who participated in ICC World Cup. A cash award of Rs.1.3 Crore for these 10 girls has also been announced by Hon’ble Minister of Railways. The Minister also announced all possible assistance from the side of Railway administration to these women players for their future performances.